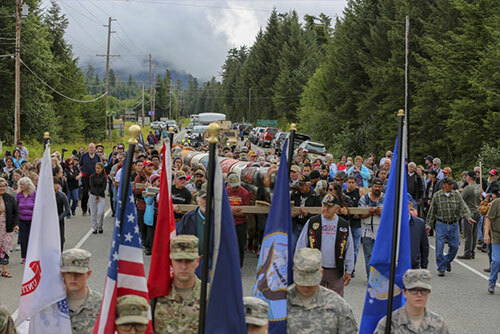 Members of the Alaska Organized Militia including the Alaska Air and Army National Guard and Alaska State Defense Force, join veterans, community members and people from across the state and nation to participate in a Veterans Totem Pole raising ceremony in the city of Klawock on Prince of Wales Island, Aug. 18, 2018. Southeast Alaska: New Totem Pole on Prince of Wales Island honors Alaska’s veterans By STAFF SGT. BALINDA O'NEAL DRESEL - The west coast of Prince of Wales Island swelled with veterans, friends and family members who gathered to partake in a three-day celebration culminating with a totem pole raising ceremony here Aug. 18. Like many of the totem poles that stand reverently on the island symbolizing or commemorating ancestors, cultural beliefs, oral history and clan lineages, this 37-foot totem stands to honor Alaska’s veterans. Isaacs, a current member of the Alaska State Defense Force and president of the Prince of Wales Island Veterans Association, worked with a local carver, Jon Rowan, a U.S. Marine Corps veteran, to come up with the totem’s unique design. The totem displays service branches and Prisoners of War-Missing In Action insignias, a 1960s-era U.S. Army Soldier, ancient warrior holding a double-headed dagger and carrying a jade pick, an eagle and raven at the top, and a set of identification tags that veterans can pin unit crests and insignia to in the bottom of the totem pole. Southeast Alaska: Forest Service seeks comment, announces public meetings on Alaska Roadless Rule - The USDA Forest Service is seeking public comments and will host public information meetings as it prepares to develop a durable Alaska Roadless Rule to further Alaska’s economic development and other needs, while also conserving roadless areas for future generations. Members of the public have until Oct. 15, 2018 to comment on the Notice of Intent to prepare an Environmental Impact Statement. Instructions about how to comment are available online (Click here). The Forest Service plans to host informational public meetings in Alaska and Washington D.C. in late September and early October. The State of Alaska, as a cooperating agency, will be hosting separate meetings to engage with the public. Ketchikan: 1978 Lab Bay Goose Crash was most deadly on record; After 40 years, still no explanation for crash that killed 12 By DAVE KIFFER - Forty years ago this week, one of the last Grumman Goose amphibians operating commercially in Southeast crashed just off the northern tip of Prince of Wales Island. Twelve people died in the crash, making it one of the worst aviation accidents in the history of Southeast Alaska. At the time, it was the highest loss of life in a Grumman Goose crash. The Goose had been the dominant mode of air transportation between the communities in Southeast from the end of World War II to the early 1970s, but with most of the larger communities getting jet airports, the regional air taxi industry was transitioning to smaller float planes such as the Cessna 185 and the DeHavilland Beaver to continue operations into the even smaller and more isolated communities. By 1985, PenAir in southwestern Alaska was the last United States carrier still regularly using Grumman Goose aircraft, although at least one Canadian company, Pacific Coastal was still flying the Goose. PenAir made its last Grumman Goose flight, in the Aleutian Islands, in 2012. Like nearly all the Grumman Goose "amphibs" that flew in Alaska, the Webber Air plane was built during World War II. After the war, M.L Hardy of Pennsylvania purchased it for $6,800. In 1948, he sold it to Dr. Walter Stafford of Massachusetts. In 1951, the giant contractor Morrison-Knudsen purchased the plane for $32,500. During the Cold War build up, Morrison-Knudsen had numerous projects in Alaska and the Goose was reported being towed into Nome by the Coast Guard Buoy Tender Clover after an engine failed 40 miles southwest of Nome. Shortly after that, Vince Daly began an air service in Alaska and purchased the Goose for $37,000. After five years of operating primarily in the Kodiak area, he sold the Goose back to Morrison for $55,000. Morrison kept the aircraft for three more years and then it passed through several owners before it was purchased by B.C. Airlines. In March of 1965, it suffered an unknown accident that cause it be declared a total loss. But, of course, its flying time was not over. Frequently, "totaled" aircraft in the Northwest eventually find their way back to airworthiness depend on how much owners are willing to spend and replace. It was sold two more times and finally rebuilt by a company in Seattle. It was ready to go by January 1968 and was purchased by Webber Air in Ketchikan. Webber operated the plane for the next six years and then sent it in for a complete overhaul. In 1977, records show that the aircraft suffered a "hard landing" and needed significant repair, primarily to the engine mounts and cowlings. That was the last time the plane showed up in government records before the fatal crash of August 25, 1978. According to Gregory Leifer's 2014 book "Broken Wings: Aviation Disasters in Alaska," Webber Airlines had originally sent a smaller aircraft to Prince of Wales to pick up passengers the morning of August 25, but that it had been unable to traverse the cross island passes because of bad weather. It was decided the plane would try again later in the day. "Jack Swain, one of the company owners, instead decided to fly the Grumman Goose, since the amphibian could carry both groups of passengers from the morning and afternoon flights and would alleviate the need for a second aircraft," Leifer wrote. "One of the passengers also had a connecting flight in Ketchikan and he (Swaim) felt obligated on getting him there in good time." Swaim left Ketchikan at 1 pm, there was a thick overcast in Clarence Strait with occasional rain showers. There was a slight breeze and conditions appeared fine for flight. At 1:45, the Goose landed at Nichen Cove on Tuxekan Island and then pulled In to the dock at Naukati. Both the morning and afternoon passengers, a total of seven. and their luggage were loaded onto the plain. Two other passengers wanted to fly to Labouchere Bay, a logging camp on the Northwest corner of Prince of Wales, but they were told to wait for a later flight. "Swaim was already irritated by weather delaying the schedule and became more irritated with the ensuing discussion over the two additional passengers," Leifer wrote. "He was in a hurry." The plane was certified for 10 passengers, but the extra gear bound for Lab Bay took up the rest of the plane's capacity. The plane left Naukati and flew on to Lab Bay where it arrived at 2:20 pm. Two of the passengers deplaned at Lab Bay and six more additional passengers joined the flight. There was more disagreement about passengers at Lab Bay. "A heated discussion then developed between Swaim and a remaining passenger (in Lab Bay) who had been scheduled without his knowledge," Leifer wrote in 2014. "He became more irritated as the conversation continued and would not allow her on the aircraft. The plane already held a total of 11 passengers, one over the maximum limit." At 2:35 pm, the plane took off from Lab Bay and turned north into Sumner Strait. Swaim contacted Webber in Ketchikan and reported that he planned to stop in Whale Pass and Coffman Cove before returning to Ketchikan. Alaska: Very Short Public Comment Period Opened for 2016 Pink Salmon Disaster Fund Draft Distribution Plan - On January 18, 2017, Secretary of Commerce Pritzker declared the 2016 Gulf of Alaska pink salmon fishery a disaster under the Magnuson-Stevens Fishery Conservation and Management Act. Following this declaration, Congress appropriated $56.3 million to Alaska to address losses to the seven management areas in the Gulf of Alaska affected by the fishery failure. The Alaska Department of Fish & Game announced the opening of the public comment period today. The comment period will close on September 07, 2018 at 5:00 PM (AST) allowing for less than an 8 day comment period. The State of Alaska in consultation with the Alaska Regional Office of NOAA have developed a draft distribution plan for these funds, that upon finalization will be administered by the Pacific States Marine Commission (PSMFC). Upon receipt of the funds, PSMFC will employ the disaster distribution plan to administer the funds to the affected entities. The State of Alaska's intent is to distribute the federal funds to the affected parties as soon as practical. MICHAEL SHANNON: Democrats Still the Party of Voter Suppression - Democrats and the rest of the left have a somewhat bifurcated approach to the vote. During their Jim Crow regime in the South, Democrats specialized in retail vote suppression. When a potential black voter attempted to register that brave individual was met with literacy tests, poll taxes and other extra-constitutional roadblocks placed by a Democrat government between a minority and the voting booth. And if that wasn't enough for the black man to take the hint, there was always outright violence as a fallback position. Today, Democrats have donated their voter suppression identity to an unwilling Republican party. They claim the GOP's tentative, Tinder-like approach to matching names with faces is "vote suppression" and racism. When Democrats were the suppressors they applied their genuine vote reduction efforts only to the subset of the population that was non-white. Accommodating Democrats often let White folks vote from the cemetery. 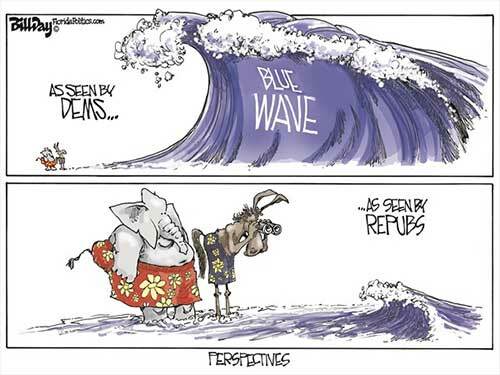 CARL GOLDEN: How Democrats Could Hurt Their Chances in November - In the face of month upon month of glowing reports of a national economy reaching new milestones, the blue wave - the movement predicted to sweep Democrats back into control of Congress this November - lost its momentum. Well, it's back, gathering power and strength and once again raising Democratic hopes it will come crashing down on Congress, washing Republicans into retirement and turning the House into a Democratic stronghold. The economic news hasn't lost its luster and promise - quarterly growth is approaching four percent and predicted to reach higher, job creation remains strong and unemployment has fallen below four percent.